"Kill the Messenger" dramatizes the true 1990s story of a California reporter who discovered the CIAâÄôs covert role in arming the Nicaraguan Contras and the spreading urban addiction to crack cocaine. New Canaan News film critic Susan Granger reviews the new movie, "Kill the Messenger:"
Set in 1996 and based on the true story of an investigative reporter at the San-Jose Mercury News, this political thriller follows the trials and tribulations of Gary Webb (Jeremy Renner), whose discovery of the CIA's covert role in arming the Nicaraguan Contras and spreading urban addiction to crack cocaine so alarmed the U.S. government officials that they made him the target of a virulent smear campaign. While working for a small California newspaper, Webb is contacted by Coral Baca (Paz Vega), the seductive girl-friend of drug trafficker Rafael Cornejo (Aaron Farb). She's furious that the government seized Cornejo's property before he went to trial and, when he was acquitted, refused to give it back. She wants Webb to expose this heinous practice and, as enticement, she gives Webb a transcript of the grand jury testimony of drug smuggler Danilo Blandon (Yul Vasquez), who admits he was recruited by the DEA. When Webb tracks down drug kingpin, Norwin Meneses (Andy Garcia) in prison in Managua, he learns the truth -- but it's off-the-record. As crusading Webb doggedly pursues one unsubstantiated insinuation after another, scooping major newspapers like the Los Angeles Times, his obsessive sleuthing not only unsettles his editor (Mary Elizabeth Winstead) and publisher (Oliver Platt), but also jeopardizes his relationship with his long-suffering wife (Rosemary DeWitt) and their three children. Based on Nick Schou's book "Kill the Messenger" about the rise and fall of Gary Webb, along with Webb's own memoir, "Dark Alliances," it's predictably scripted by Peter Landesman and heavy-handedly directed by Michael Cuesta, best known for helming the pilot of the hit TV series "Homeland." Cuesta and cinematographer Sean Bobbitt evoke that same sense of tension and imminent danger, utilizing hand-held photography and intimate close-ups. While Jeremy Renner ("The Hurt Locker") embodies Webb's indignation and intensity, his demise seems inevitable. And Cuesta's use of sound bites and film clips jarringly veers into documentary territory. 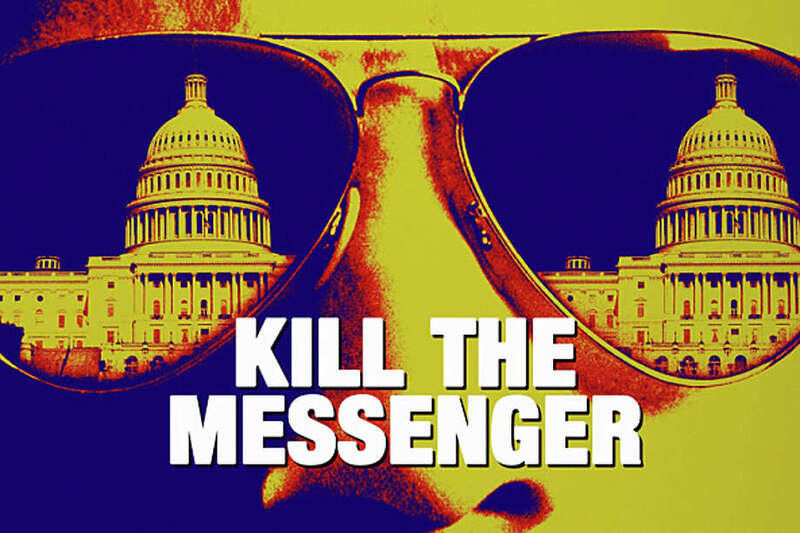 On the Granger Movie Gauge of 1 to 10, "Kill the Messenger" is a suspenseful 7, focusing on the fate of yet another truth-seeking whistleblower.